Klayar Beach is resides in Donorojo district, Pacitan Regency. It is about 35 km towards west Pacitan city. It can reach about 60 minutes from the city. Many rockies like spink in Mesir are settled in this beach. Klayar with its dune has a distinctive feature from another. Its waves dashed against the rock spourting from the hole make sound like a bamboo flute. The springkling of waves rush to the beach and out through the hole spurting about 7 meters high and has a sound like blowing bamboo flute. Klayar Beach has charming beauty. This beach is really natural for not many visitors that coming to this beach. Klayar beach is very silent; you can even hear the wind that blows and enjoying the nuance around the beach. 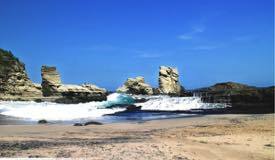 Klayar Beach is located approximately 45 km west of Pacitan and can be reached by motorcycle or private car. When traveling to Klayar the visitors will be faced with a challenging road like narrow steps and broken road in some parts, the sharp turns and hilly route. There are several sections with the rise and fall that quite extreme. Nevertheless, the scenic beauty of the hills and green valleys will accompany all the way to Klayar Beach. Klayar beach can be regarded as the beach that suitable for surfing. At certain times, the waves that exist are very suitable for surfing. In addition, the bluish panoramic and white sandy beach will pamper your to stay longer at this place. To reach Klayar beach can be accessed by using car or motorcycles, while public transportation are available in the morning, together with local people that going to the market. If you are from Yogyakarta, there are some routes that can be chosen, but the fastest way is recommededly from Gunung Kidul regency, via Wonosari, and it takes only 2,5 hours. The route to Pacitan from Gunung Kidul Wonosari will be: Wonosari – Pathuk – Wonosary city – Pracimantoro – Giribelah – the border Central Java & East Java – Punung – Klayar. While those that coming from Solo via Pracimantoro, they can carry on the route until reaching Giribelah and turn right to Kalak and it arrives in Klayar.